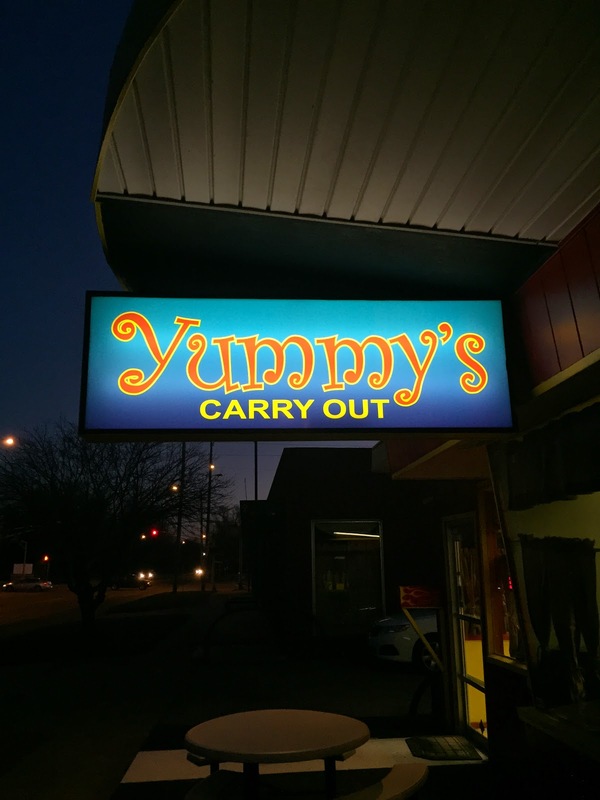 Yummy’s Carryout Review – Wichita By E.B. If it’s one thing I haven’t done in a while, it’s go to a restaurant that is off the grid; a restaurant I would wager a majority of readers have never heard of. The other night, I set my eyes on finding some place while driving around the streets of Wichita that had the “Hmmm What’s This Place About?” feel. My drive took me down the streets of south Hydraulic where I randomly saw a building that stuck out of nowhere thanks to their bright glowing sign. I pulled over to the side of the road and quickly did a google search on them before deciding to head on in. What’s the place? It’s Yummy’s Carryout located at 1935 S Hydraulic St right across the street from Linwood Park. Yummy’s Carryout is a small, locally owned restaurant that features mostly burgers and sandwiches. 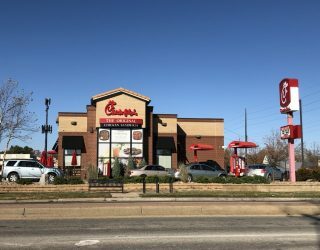 The building is quite small and features only four bar stool seats, a drive thru, and two tables outside thus the name “Carryout”. Upon walking inside, I was politely greeted by a gentleman working there. I struck up a conversation with him and told him I had never been and what to order. He suggested the most popular item being discussed on their Facebook page was the Brick House Burger (picture on their facebook page) which is big enough to feed around three people. Jokingly I told him to look at me and noted that my body probably couldn’t handle that much food and asked what the second most popular item was. His suggestion was the Wolf Burger which was a hot link, hamburger patty, grilled onion, lettuce, tomato, cheese, and special sauce on toasted bread. For me it sounded pretty delicious so I went ahead and ordered it, minus cheese along with some of their homemade French fries. It took around 13 minutes for my burger and fries to be done from the moment of ordering. When it came out, the smell of the burger alone was appetizing. Grabbing the burger alone was hard enough that I had to request a knife to cut it in half. The burger had a great blend of spices. I usually order my burgers with no onions but the onions added really good flavor to it all. Pretty sure there were some jalapeños in there which I didn’t mind at all. The toasted bread was an excellent substitution to the sometimes boring hamburger buns. My preference is usually thin cut fries similar to what you find at Freddy’s but the seasoning and lack of grease made Yummy’s fries…well…….yummy. All in all, I was very pleasantly surprised with my Yummy’s Carryout experience. The service was very friendly, the food was delicious and the only knock I would say is the speed of food delivery. If it was all done carryout, 13 minutes would have been a little long. This place does accept cash and cards but there is a dollar charge to use a card. Otherwise, Yummy’s Carryout gets my approval. Check this place out if you’re into venturing out in that area or happen to be around Linwood Park. I have been meaning to stop and give this place a try. We loved the burger joint that was in this location previously and were sad to see them go. I will definitely have to check it out.